This site has been set-up by the North Weald Airfield Users Group to inform you about the activities which take place on the airfield and also as a focus for the ongoing campaign to prevent the airfield from being re-developed for housing or other purposes which would threaten its future as an aviation facility. North Weald Airfield was established in 1916, was in front line service during the Battle of Britain and is still very active, not only being used for aviation, but also a wide range of other sporting and leisure activities. It also hosts the UK's largest open air market, every Saturday. It is home to a number of aviation and non-aviation businesses, offering employment opportunities to the local community. See the activities section of the website for more details of what takes place on this historic and versatile location. See the airfield webcam / weathercam below (courtesy of S2T Group). North Weald boasts some of the best aviation facilities in Eastern England, with it's long tarmac runways, engineering services for all types of both historic and contemporary aircraft and its excellent volunteer fire service . It also has endless possibilities for other sports and leisure uses. 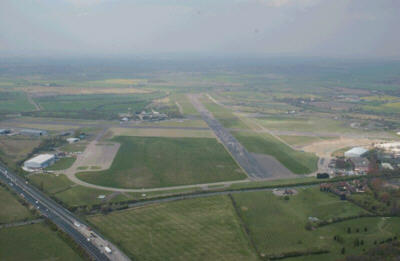 It also enjoys the support of the local community, who are proud of "their" airfield and its history. This is reflected by the fact that the village sign of North Weald Bassett depicts a Hurricane flying over the airfield. As such it should be preserved as a versatile facility to be enjoyed by future generations and also as a permanent memorial to those past. Click the links in the left hand column and at the top of the page for more details, history, events etc.